Rats are very destructive pests that can spread disease, contaminate food and food preparation areas. They can cause costly structural damage and even cause house fires by chewing on electrical wires. Rats can be found in all areas of Southern California. Rats live in close association with humans. Rats are nocturnal and tend to move indoors to warmer areas during late fall or early winter and return to the outdoors in late spring or early summer, or remain indoors if food and suitable harborage are available. Rats generally have poor sense of vision, but they have acute sense of smell, touch, and taste. They tend to gnaw through any material that is softer than their enamel, and they are generally good climbers, jumpers, swimmers, and burrowers. Rats are most active at night. If they are seen during the day, there is a good chance there are more around your home. Rats eat all types of food, including human and pet food. Roof rat is slender and agile, and Its tail is longer than the head and body lengths combined. Its total length may reach 12 to 17 ¾ inches and can weigh up to about ¾ of a pound. Roof rat nests above ground and lives in ivy, wild blackberry vines, attics, garages, and wood piles. It will enter buildings if given the opportunity, and often use utility lines and fences as runways. It prefers to feed on fruits, nuts, ivy, and pet food commonly found in residential areas. Norway rat is larger and more aggressive than the roof rat. It has smaller eyes and ears than the roof rat, and its tail is shorter than the combined head and body length. Its total length may reach 18 inches and may weigh up to about 1 lb. Norway rat lives and nests in underground burrow system and is generally found in agricultural areas, creeks, sewers and occasionally developed neighborhoods. It can also live in buildings, basement, waterfronts, under blackberry vines, under wood piles. It feeds on garbage, pet food, meat scraps, cereal grains, fruits, and vegetables. House mouse is small, slender bodied, and the tail is longer than the length of its head and body. Its body size ranges from 2-1/2 to 3-4/5 inches long. Its body color is generally grayish brown with a gray or buff belly. House mice are agile climbers and can fit through openings as small as ¼ inches in diameter. It eats many types of food but prefers seeds and grain. It normally travels an area averaging 10 to 30 ft. in diameters. Plague: People can be infected with plague from fleas that feed on infected rats, or from being bitten by an infected rat. Food poisoning: Eating food that has been polluted with rat urine or droppings can cause food poisoning. Rat-bite fever: A bite from an infected rat can cause rat-bite fever. Parasites: Some rats can carry tapeworms. Rat droppings in garages, storage buildings or other sheltered areas. Sounds in the attic, floor, and walls. Rub marks caused by greasy rat fur. Stripped bark from plants and trees. Piles of cut snail shells hidden under plants or piles of wood. Damaged, partially eaten fruits and nuts, such as walnuts, oranges, and avocados. Broken or missing foundation vent screens or attic vent screens. Open wooden meter boxes (in older homes). Space between roof jack and vent pipe. Under or on sides of the garage door. Brick chimneys which have settled away from the house. Crawl hole with poorly fitted lid. Broken or missing roof tiles. Broken or open building sewers which connect to the main sanitary sewer. (Norway rats). 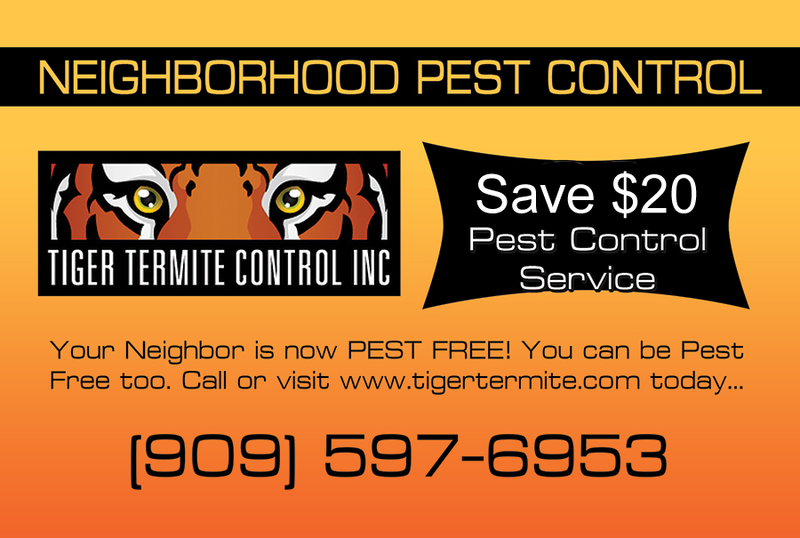 Includes complete inspection of your home to find rodent entryways. Includes setting traps to capture rodents and removal of rodents. Includes placement of up to (4) exterior rodent bait stations. Includes (2) additional weekly visits to clean and reset traps. Includes recommendations and bid for sealing off rodent entry points. Includes recommendations and bid for attic sanitation and clean up. Includes recommendations and bid for removal and replacement of insulation.